Why Pear Shaped Stone Option is Best? In the present scenario, we can see a number of different diamond’s shapes as well as other gemstones suitable for engagement rings. You can pick the best from princess, oval, marquise, round, radiant and even heart shaped diamond cuts. Pear shaped diamonds are additionally one of the most favourable options that you can choose to make your occasion more memorable. The appearance associated with this shape of diamond are limitless and a range of settings as well as side stones can be added to the ring. They assist you show off your unique side as they are not as popular as the more conventional gemstone cuts for example round or princess diamonds. Elegant pear shaped rings consist of 58 facets and do not require as good a quality of clarity as a diamond shape with less facts for example an emerald diamond as the facets can help hide the inclusions. Longer pear shapes are liable to add length as well as a slimming effect to your beautiful fingers. To achieve a diamond that is a pear cut for an engagement ring, the cutter is required to form 58 facets on the stone. This is not a task for a trainee therefore working with a master of diamond cutting is perfect. After all, you are offering this ring when proposing marriage to your beloved thus it must be perfect. 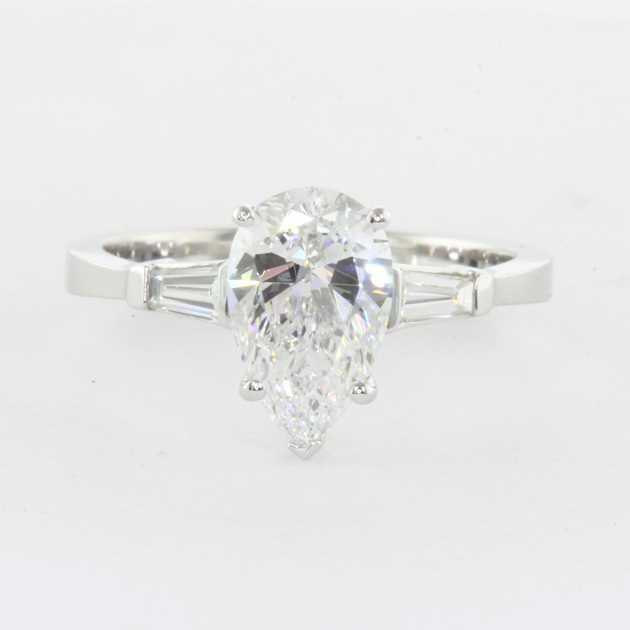 When glanced from a side view, the diamond must have a depth of around 53% of its general width. The flat facade of the stone ought to extend over 51% of the diamond's surface. The underside of the stone (culet) should be tiny as well as come to an overstated sharp point. Consider your colour choices when selecting a pear shaped ring, as you are have many. Always remember that the colour you prefer can appear darker at the crest of the diamond and become paler as it arrives the rounded part or vice versa. Colour is an essential aspect when picking out a gemstone. It must remain at the top of your prioirty list when shopping for an engagement/wedding ring. There are various settings utilised when designing an engagement ring, however the prong setting is the finest preference for the pear shape. Because of the intense fire which this type of stone has, prongs allow light to hit the stone as well as refract within the gem. Additionally, the peak of the diamond is the most delicate part and it needs to be protected via a prong setting. Think about having at least three or more prongs to make sure the security of your precious diamond. In order to have best engagement rings Melbourne, Goldenet is providing high class services and a huge range of products so that you can get exactly what you desire.